How Thrilling is my Life Story? Herb works for Western Display Fireworks as the Lead Pyrotechnician for various fireworks display each year on the Fourth of July, including Clatskanie and Astoria, Oregon, and Long Beach and Liberty Lake, Washington. Herb is a certified pyrotechnician in Oregon and a licensed pyrotechnician in Washington, and has a commercial drivers license with hazardous material endorsement. He is also a member of the Pyrotechnics Guild International. JVC GS-TD1 3D camcorder (both with and without the Cyclopital base extender attachment) (for setup sequences). Pair of Panasonic HDC TM700 video cameras, mounted on tripods approximately 20 feet apart and quite some distance back from the launch area (for hyper firework bursts during show). Pair of Creative Vado video cameras, mounted side-by-side on a tripod (for close shots of the mortars being lit). GoPro 3D Hero System, mounted on Herb's helmet during the firing of the display. For information on how to obtain a copy, or questions about viewing this Blu-ray on your 3D TV, contact Herb. Note that the 3D printed part does not include the screws. 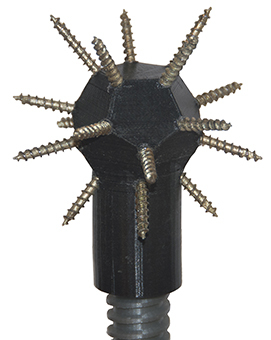 To insert the screws, Tap threads into screw holes (using for example SPAX Multi-Purpose Construction Screws #8 x 2 inches), Cut heads off screws (leaving about 1 - 1.25 inches) and use locking pliers to screw the cut-off end of the screw into each hole. Leave about 0.43 inches of the screw protruding to clean 2.5 inch or larger mortars. Longer screws can optionally be used and more can be left protruding to clean larger mortars. 20 screws are required. Copyright © 2017 Herb Weiner. All rights reserved.